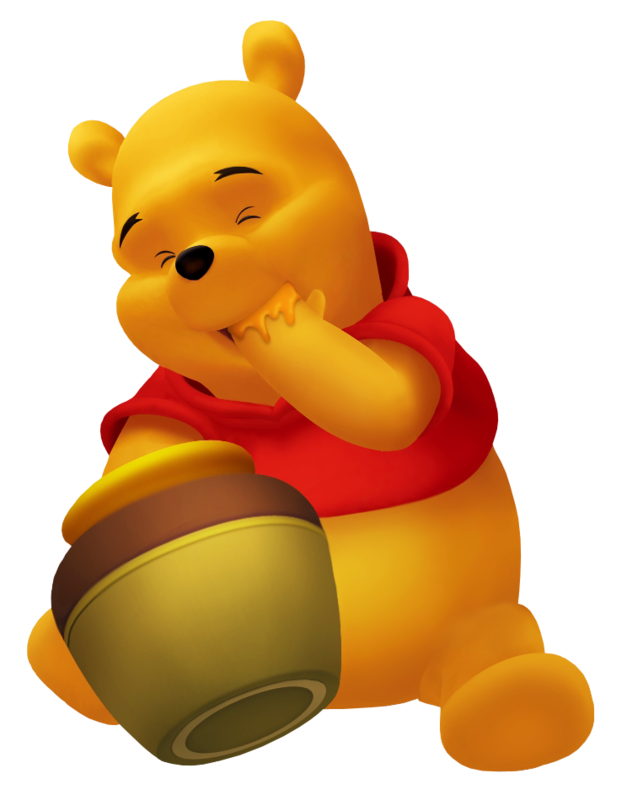 Winnie the Pooh is a small yellow bear with an affinity for honey. Pooh also tends to be a bit absent-minded and is often unaware of his surroundings. Pooh is also regarded as a leader to all of his friends - the best of which is Piglet - despite the fact that Pooh is a ‘bear of very little brain'. Winnie the Pooh lives in a house inside a tree which is nestled in the cozy 100 Acre Wood. When Sora first enters the enchanted book that was given to Merlin by Cid, Sora appears in a quiet meadow where there sits Pooh on a log. When Sora approaches an apparently distressed Pooh bear, Pooh asks Sora whether he is there to say goodbye to him. Winnie the Pooh goes on that all his friends are missing as well as his favorite honey tree. Also, he is a very hungry bear. As more pages are added to the book, Pooh meets up with his friends Piglet, Tigger, Rabbit, Roo, and Owl, all the while on a never ending quest for more honey. However, at the end of the day, once all the pages are found and restored, Pooh wishes a fond farewell to Sora, and says that Sora is always welcome back if he chooses to return. A honey loving bear that lives in the 100 Acre Woods. He has a morning routine of performing stoutness exercises in order to improve his appetite. Sora met Pooh in his first journey, when Pooh's book was ravaged by the Heartless. By gathering the torn pages, Sora brought back Pooh's friends, and ended up being the bear's friend himself. It is hardly a happy reunion the two can enjoy once they meet again, however, as due to Sora's carelessness, the Heartless stole pages from the book once again, and this time, Pooh's Memories along with them. Thankfully, each page Sora finds restores a bit of Pooh's Memories, but it seems Sora himself is the last Pooh's able to remember. He does eventually, however, and makes a promise to Sora. As Sora can't help but leaving, Pooh'll be more careful this time, and keep Memories of Sora safely in his Heart. That way, the two can be together, even when far apart. Deep in the Hundred-Acre Wood, you'll find a silly old bear, stuffed with fluff with a very little brain and a huge appetite for - HUNNY!!! Pooh appears as a Command Board character that you can play against when the player enters the Hundred-Acre Wood through the book Merlin the wizard dropped in Radiant Garden.